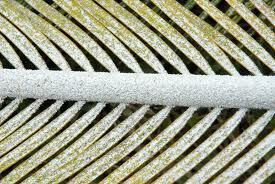 I have been asked by many Gainesville lawn care customers about white stuff being on their Sago Palms. It has been described to me as almost like snow that just takes over the plant, and tends scaleto build up on the bottom areas of the fronds. Most people think that this is a disease or a fungus, but this is actually a pest called the Cycad Scale or Aulacaspis Scale, also known as (Aulacaspis Yasumatsui). It is an extremely small insect and can easily start to take over your Sago Palm or your other Cycads as well. The Cycad Scale or Aulacaspis Scale was brought to the country by accident in the mid-1990s. It originally came from Miami, and has been spreading north ever since. The Cycad or Aulacaspis Scale is not necessarily hard to kill, but if you have an infestation it may be difficult to eliminate the issue permanently. There are a couple of reasons for this. The scale can move from the fronds, to the trunk, and even to the roots of the plant. If the pest has become root bound then it is quite difficult to kill. The second reason it may be difficult to permanently remove is that your neighbors probably have the same issue, and since the pest transfers from Cycad to Cycad quite easily by just wind it becomes difficult to wipe out the entire species at one time. That is unless you can organize a neighborhood pesticide landscaping application for the scale. If the Cycad or Aulacaspis Scale is not controlled, it will kill your plant. How do you remove the white stuff, or Scale, on your Sago Palms you ask? I have found the best way to control this pest is to prune off the infested fronds and toss them in a sealed bag to minimize the spreading. I normally just remove all the fronds all together if there is an infestation. This way you do not have to worry about the transferring of the pest from frond to frond. Pruning back the fronds will not damage it any more than leaving them with the Scales on them. New fronds will grow back in a short amount of time. Once you remove the fronds, you then want to purchase some horticultural oil. More specifically paraffin-based ultra-fine horticultural oil. Organocide is what I tend to use, and seems to work best. Many types are available at any garden shop or store. Mix according to package instructions. Once mixed apply the spray over the areas of the plant and be sure to apply on the areas where the scales are still noticeable even after removing the fronds. This oil puts a blanket over the pest and prevents it from breathing and causes it to die. If you do leave fronds on the Sago Palm, be sure to spray the undersides as well as the tops of the fronds. I have also found that adding a tablespoon of insecticidal soap will work in the same way as the oil to help kill the pest as well. You will need to continue to spray weekly for about 5 weeks. I recommend spraying the Cycad with a garden hose on full blast to wash away any oil buildup and dead scale after the first application. As I mentioned earlier the pest will most likely return after it has been controlled. If so, continue this process as needed. There has been testing that may give us hope for having a less time consuming option available in the future to help control this insect in your landscape or garden. One test is taking a look at a beetle that preys on the scale and the other is a parasitic wasp. If all goes well these tests will prove safe and successful and will be a better long term solution to this issue. If you have any questions on this topic or would like my assistance in taking care of an outbreak on your property, please send me an email or give us a call at (352) 505-3411.